Just a heads up: I'm not developing this anymore, and I'm not really a regular visitor to the Software forum anymore, so reporting bugs and requesting features is probably a waste of energy. Any possible problems you have have surely been addressed somewhere in this thread, so just have a look. Attention: FeedBack supports just about any .mid file you can throw at it. So unless you need a bunch of them converted at once, I'd go with FeedBack to do Mid2Chart conversion. So this is now only really useful for Chart2Mid conversion (that way is more stable anyways). VISTA USERS: If you get the "Cannot find main class" error but you've done everything right and have tried running the program as the administrator... well you're screwed, Vista blows balls. Try the .exe file. This program is designed to generate .mid files formatted specifically for Guitar Hero 2. The format for GH3 is different, but it has been confirmed to work with GH3 for PC. It works for both, I've been using it and I have GH3 for PC. Don't post saying your mid/chart didn't convert correctly without linking to the file in question. "It didn't work" doesn't help me help you. Freetar and FoF mid files are not supported. Make sure you extract the files to your computer. You cannot run the program from inside the zip archive. HELP! I DOWNLOADED THE PROGRAM AND ALL I SEE ARE WINZIP/WINRAR FILES! NOW WHAT? Download the latest version of Java from java.com. Option 1 - Then from any folder, go to Tools-->Folder Options-->File Types-->JAR files, and change the program it opens with to a Java Runtime Environment (C:\.....\Java\jre <version>\bin\javaw.exe). Use Google if you need help with this, it's not rocket science and this thread is for comments about the program itself, not how to use a computer. HELP! I RUN THE PROGRAM AND IT SAYS "Could not find the main class. Program will exit." NOW WHAT? If you get any bugs or something isn't converted right, please post here. Update 1/18/08: Fixed the section names created when converting either way so they load and are read correctly from FeedBack. Update 1/13/08: Basically an update for myself - When importing a mid with no EVENTS track, "Marker" events (FF 06) from the sync track will be parsed as section names. 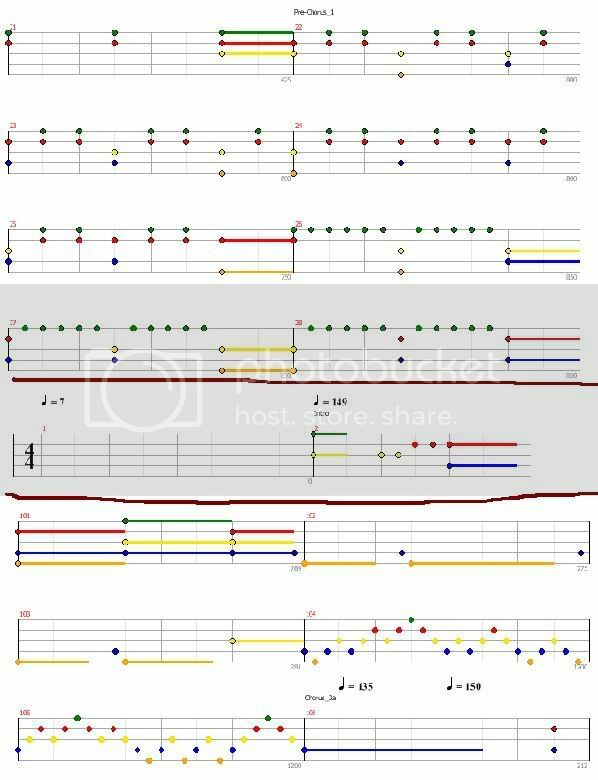 I do this because I use these when charting with Guitar Pro 5, and that means I don't have to go and re-add them when using FeedBack. - For some reason Java sometimes (there's been one case) decides it can't read what appear to valid MIDI sequences. If you get an Unknown Error message, try using GameZelda's ChartGen. Sorry. - Implemented a GH/RB option (radio buttons, not in the current screen shot), which only decides whether or not to write a PART DRUMS track or not. Chart2Mid gives the option, Mid2Chart writes it if it's present. - (Chart2Mid) Generates default FaceOff sections (the entire chart) if none present. - Added reverse conversion Mid2Chart. - Changed the UI to allow queueing so many files can be converted at once. Both .chart and .mid files accepted, and will be converted to their opposite form. Labeled notifications still appear at the bottom. Conversion may take a couple seconds per song, so be patient if converting a large number of songs. - Figured out how to get rid of that awful Java User Interface and switched to a Windows XP UI. - Added a text field that will display any modifications made to the chart. This includes the offset, adding a missing end event, and ignoring unsupported text/track events. Valid events were determined using the list from katamakel's sticky, "GH2 MIDI Encyclopedia/Dictionary." - It's been reported that all difficulties need at least one event, so any empty note tracks now have the trademark 5-button chord at position 0. This will also appear in the Notifications area. - For whatever reason, some charts have exponentially small offsets (123e-456), so any Offsets smaller than .001 (dB's smallest increment) are ignored and treated as 0. Extract all files to the same directory, run the jar file. Make sure .jar files are not associated with WinZip or WinRAR on your computer. New mid or chart file can be found in the same directory and with the same name (with the opposite extension) as the original file that was converted. Instructions, Errors, and Confirmation will appear next to the Status. Modifications/Issues will appear in the lower text area. Download it here (JAR) or here (EXE). Thanks a ton to everyone who helped me test and debug this! Nice work, I've tried this on one of my charts but it didn't do an offset. Maybe there should be an offset option on the application? Also, I opened it up successfully in FeedBack, but all my notes all hold notes and it looks very strange. (Here is my chart if you want to know for reference http://www.savefile.com/files/1283775) I haven't tried to load this in GH3, but I will try tomorrow. Well the offset thing, as I see it, is really more suitable for VGS files, that's how I've always used offsets (on the mp3 to match the mid, not the other way around). I'm not sure if FeedBack has a different function/definition of it, so elaboration is welcome. And yes, they'll look awful in FeedBack, but that's because dB's .mid support is very limited, mainly just official GH mids work correctly. I had the same problem with the perfectly valid mid files I've been making since day one. So the litmus test for how accurate the mids are coming out will be their preview in GHex, really. I've tried to convert the Eruption (CH) version and Rude Mood and I got the infinite/extremely long sustains problem with both. I've tried ordered the sections manually, and that doesn't still work. (Ok, I failed to do it in 24 hours... ). Are the terrible sustains in GHex as well? I know FeedBack will distort them. My main concern is GHex. That's a perfect game preview. There shouldn't be bad sustains, because there are Note Off events their appropriate places in the mid when I analyze it in a hex editor. If these sustains appear in GHex, I've royalled screwed up something and I need to hold off on even giving out a beta version of this until I can look at it myself in GHex. Anything else seems to be working fine except the sustains. Thanks a lot for the pic, didn't mean to be a pest, it looks terrible, lol. Of course I'm not going to point fingers at your Mid2Chart, you're quite obviously a more skilled programmer than I am. Having said that, though, I see no reason why those should be sustains, the program generates Note Off events (0x80 - command 8, on channel 0). When I listen to the mids generated they don't sound like they're all sustaining - I can clearly hear which notes are held and which are terminated immediately. It is encouraging to see that the bpm changes and star power events display correctly though. That's strange though - Star Power notes sustain correctly but everything else is wrong? Also: If anyone runs into a bug that adds an event multiple times (eg 4 [play] events, one from each skill level) I've already fixed it, but it's not worth rebuilding the jar and re-uploading it. Of course I'm not going to point fingers at your Mid2Chart, you're quite obviously a more skilled programmer than I am. No, I am not. I did learn C only 3 months ago, but I did also know PHP a year ago, but didn't do too much with it at all. Having said that, though, I see no reason why those should be sustains, the program generates Note Off events (0x80 - command 8, on channel 0). When I listen to the mids generated they don't sound like they're all sustaining - I can clearly hear which notes are held and which are terminated immediately. So, I mean, it might be something with your Mid2Chart, but I'll obviously look into this more when I get back to my computer. Maybe the problem is caused because Mid2Chart generates "unordered" charts, but I can't see any reason that can be causing this on the generated and ordered chart. It is encouraging to see that the bpm changes and star power events display correctly though. That's strange though - Star Power notes sustain correctly but everything else is wrong? Something's fishy with that, lol. I'm going to test one thing. The test is just: Open the chart in Feedback, then save it. dB cleans a lot of junk, but after opening and saving it, it doesn't work anyway. This section illustrates the previous idea of the endless sustain, as outlined. As well as showing the endless sustain, this section shows the previously stated offset problem as well as why it could be an issue. You will notice the 5-note chord at the first measure bar. This happens on normal charts when FeedBack has an offset of 0. GHex also does this when converting charts to midis. It is an inherent problem in the conversion. I am not really sure what causes it, but I know that many charters do what I do and use the FeedBack offset method in order to keep their charts looking professional and match up with the lines. And yes, I've checked. This 5-note chord does show up in-game. This is basically just an extreme display of the endless sustain. But wouldn't it be crazy if I left the real chart like this? Anyways, hope that helps. Good luck with development! One week, only 7 people had Awesomeness Detection on, and they were all young and did not play well. Thus, Naked Brothers became DLC. 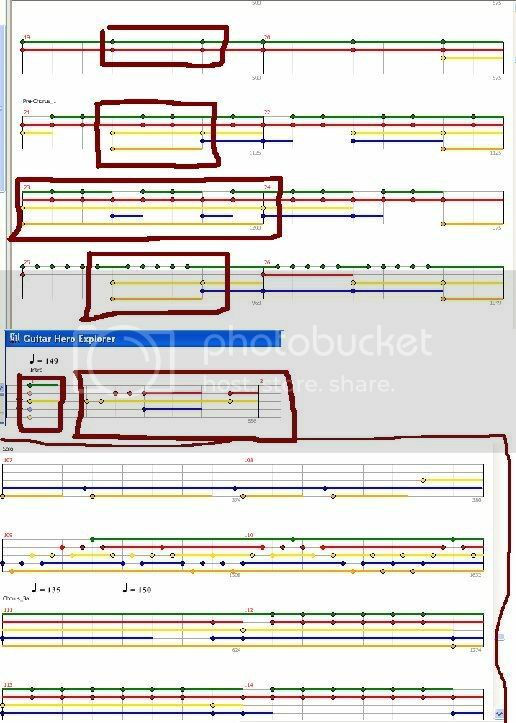 Ok.. Oddly enough when I play the .mid in GH3, it gives me the old version of the song.. I tried replacing the .mid over another song and the game crashed. Wow thanks bodom, that looks just awful, lol. I'm thinking right now that perhaps it's because when I generate a Note Off event, I give it a velocity of 0? I used 0 just because I saw a couple examples doing so but it kinda seems a velocity of 0 would cause the note not to register perhaps? Other than that it's gunna take some real figuring out. I'm not really sure what causes the 5-button chord at the beginning either, I'd always worked around it just by using a rest for the first measure when making my .mid files, I thought it was only generated if you tried putting a note at offset 0. If I understand correctly, setting Start to 1 in FeedBack moves everything back one quarter note, and that's how you ensure there's no 5-note chord? FeedBack also doesn't scroll back to before that point, so what does the tempo/time signature default to? I noticed in your example the first measure was at 4/4 time at 7bpm, so did you use a Start offset of 4? And what determines the tempo at that point? Thanks so much again for the screen shots and descriptions, I updated the jar link to set Note Off velocities to 64 and to offset the chart by (Offset * 480 ticks), so if you (anyone) wanna do another quick test just for those two issues that'd be nice. The tempo and time signature before the start of the actual chart will default to (Offset/4) time at 120bpm just because I don't know what else to do with that at this point. Step 1 is getting rid of that 5-note chord, then we can figure out what to do with the tempo. EDIT: ^-- that's all crap. I looked at your chart, Offset was 30.1. Does that still mean 30.1 quarter notes? And the tempo is calculated so that those 30.1 quarter notes are contained in one measure? Start offset was around 30 in dB. I think this translates into 30 seconds. It basically just adds in the equivalent of 30 seconds before the first note. Sorry that I don't have more to add, but I'll be glad to help out more when I can be of use. Here's your midi, in textual format (with GHParse, included in the Chart Generator pack). In bold, the expert notes. As you can see, for some reason you're not closing the notes until another note-on for the same note comes, that results in a "infinite sustains" look. Well isn't that a kick in the pants... thanks for the confirmation on that, I just can't figure out why they're not being placed correctly. Here's the method that should be adding the note on/offs (exception handling removed). If I'm missing something obvious let me know, otherwise I'll just have to start playing with it this weekend try to figure somethin else out. When trying to convert charts with a decimal offset, I get a NumberFormatException because parseInt is being used to read them instead of parseLong. ....Yeah, these stack traces really are helpful! EDIT: HAHAHA, look what I found in the file format details! 3) The pulse duration of a note is determined by subtracting the timestamp of the note-on event from the corresponding endpoint event. 6) At any given time stamp, note-off events will be placed before note-on events. Duplicate note-on and note-off events within the same timestamp are ignored for purposes of determining note endpoints. In this case, the term "duplicate" means a situation where a note-on or note-off event specifies the same note-number as a prior event occuring at the same timestamp. So putting the note-offs at the same time as the note-ons was what was causing the infinite sustains glitch. I hope. You just lost the game. Sucker!